The various items were carefully collected and redeemed by the owner Stoile Trajkovski. He said that nowadays it is very easy to get to the objects, but it is difficult to get to the really valuable ones. "It is very easy to find the items, but it is difficult to get to a valuable material. Now a lot of people are selling various items, because they must, or due to crisis, because they have no money and sell everything. This was not the case in previous years", Trajkovski says. He said that Turkish tourists are the main clientele. They mostly buy old coffee services produced in factories that no longer exist - Porcelanka, Staklara - Skopje, Keramika. 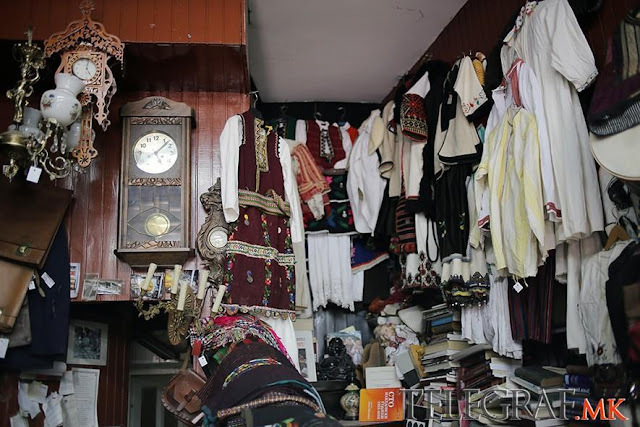 In addition, foreign tourists are very interested in traditional Macedonian costumes from the late 19th and early 20th century. The Galichnik costume is the most expensive piece or object that is sold in the antique shop and costs MKD 20,000. "The costumes are sold from MKD 4,000 to 20,000. Galichnik costume is the most expensive dress, which costs MKD 20,000. It has silver buttons sewn on it. Skopje costumes are sold for MKD 4,000, and we redeem them for MKD 2,500", Trajkovski said. Also popular are the coins and the traditional Macedonian jewelry, such as the belt buckle the Macedonian brides wore. It even has a special place on the wall in the antique shop, in a frame. This antique shop is a real little treasure for all Yugo-nostalgic people. 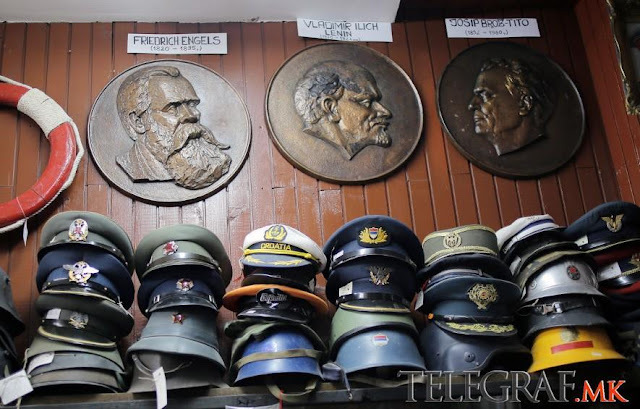 Titovki, medals, helmets, badges, medals, uniforms, flags – all from the days of Yugoslavia. Titovki are sold for MKD 600 and Yugoslav officers' hats for MKD 1,800. We also noticed a well-preserved German helmet from the World War II, which is a bit more expensive, MKD 6,000. 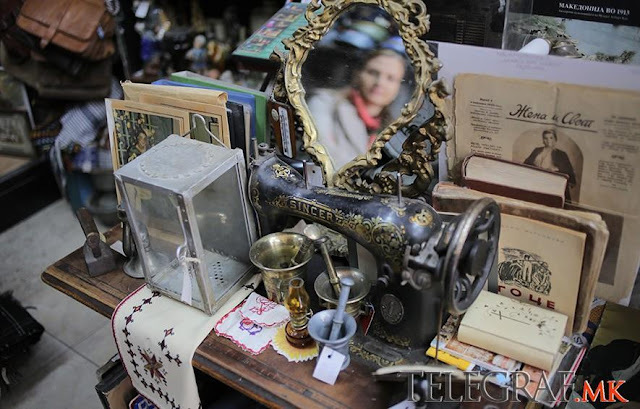 In a sea of traditional costumes and uniforms which are the most frequent items in the two stores of "Pella antique", there is a Singer sewing machine which is half a century old, hand-Russian camera from the socialist times. Especially interesting and preserved in excellent condition are both radios - one German from 1943 and one Yugoslav from 1957 produced in Radio Industry - Zagreb. 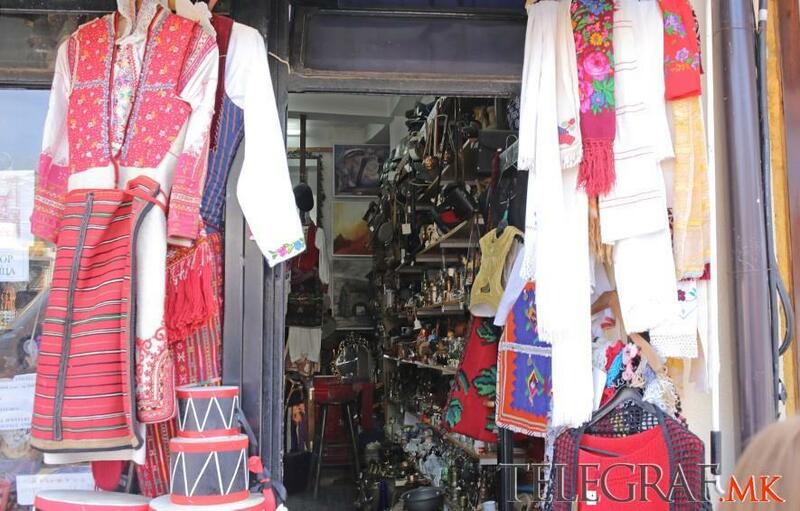 Something that is one person's waste is another's treasure - you may find yours in one of the shops for antiques in the Skopje Bazaar.